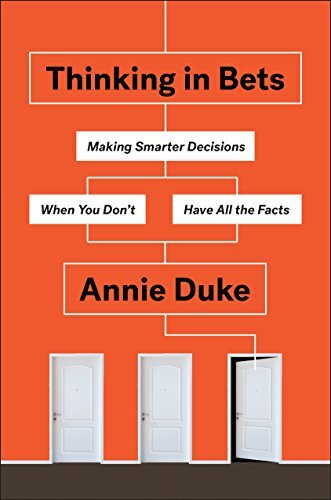 I learned a lot about decision making under uncertainty from Annie Duke’s new book, Thinking in Bets: Making Smarter Decisions When You Don’t Have All the Facts. Annie first mastered decision making in the field of poker. She won a World Series of Poker gold bracelet, the World Series of Poker Tournament of Champions, and the NBC National Heads-Up Championship, and earned more than $4 million in tournament winnings. It turns out, her approach to making decisions at the poker table translates into making decisions in business and life. In poker, you don’t know what cards your opponents are holding and you can’t predict how they will act or what cards will draw next. Similarly, in most aspects of life, you don’t have all the information you need to make a decision and it’s impossible to predict the future with perfect accuracy. That’s what Annie’s book is all about: Estimating the probability of different futures and making decisions, or “bets”, accordingly. Here are 16 lessons I learned on improving decision making under uncertainty. The outcome of every decision you make provides feedback on your decision making process. 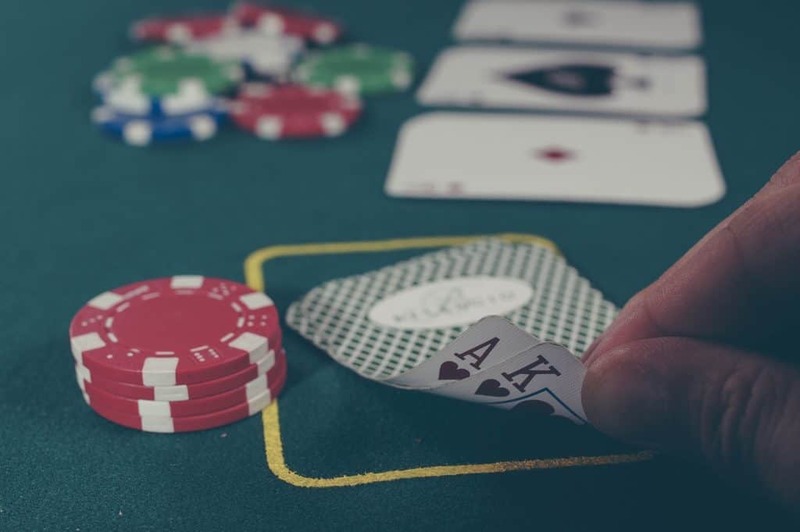 However, when you are making decisions under uncertainty – such as playing poker or starting a business – you inherently have limited information to work with, and there are a number of potential outcomes, each with different probabilities. Therefore, “winning and losing are only loose signals of decision quality,” Annie says. You can make the right decision given the information you have and still not achieve the desired result. And you can make a poor decision and get lucky. It’s impossible to predict the future. It’s important to acknowledge that there’s some degree of uncertainty in almost every decision we make. We make decisions based on the information that we have and the beliefs that we develop as a result of that information. Therefore, it’s critical that we work to improve our beliefs if we want to make better decisions. “This is how we think we form abstract beliefs: (1) We hear something; (2) We think about it and vet it, determining whether it is true or false; only after that (3) We form our belief. These inaccurate thinking patterns happen because of a number of cognitive biases that Annie touches on in the book. These cognitive biases have benefit from an evolutionary perspective. Ultimately, “Thinking in bets embodies skepticism by encouraging us to examine what we do and don’t know and what our level of confidence is in our beliefs and predictions,” Annie writes. “I’m not sure” and “I don’t know” are often statements of fact, and can, therefore, help with decision making under uncertainty. It’s ok if that knowledge is limited. “We have to make peace with not knowing,” Annie writes. It’s the first step to learning. “Improving decision quality is about increasing our chances of good outcomes, not guaranteeing them,” Annie writes. She recommends thinking about all possible outcomes, estimating the probability of each outcome, and making a bet (decision) accordingly. You have control over the quality of your decisions. You don’t have full control over the outcomes of your decisions. For example, a football coach can go for it on fourth down instead of punting, fail to achieve the first down, and still have made the correct decision. There are a few potential outcomes of going for it on fourth down (first down, interception, touchdown, etc.). Each one of those outcomes has a probability of being realized. The decision to go for it on fourth down may have been a good decision, even if it fails to achieve the desired result. If you have an overly tight connection between outcomes and decisions, you might succumb to this bias. In reality, you can only make an estimate about what will happen in the future – you can’t know with certainty. Annie recommends building a community or mastermind group to analyze decisions you have made or need to make. As discussed above, outcomes are not a good signal of decision quality. That’s why Annie recommends analyzing the quality of a decision before knowing the outcome. Her poker mastermind group discussed the decision making process of a hand but often never shared the outcome of the hand. It doesn’t matter if you win or lose the hand. The decision making process is more important. We tend to favor our present-self at the expense of our future-self. For example, your present-self is happier if you push the snooze button on your alarm clock in the morning. However, your future-self will be happier if you get out of bed earlier to work on your side business. “Bringing our future-self into the decision gets us started thinking about the future consequences of those in-the-moment decisions,” Annie says. Think about how your future-self will feel 2 years from now if you hit the snooze button. Imagining success can help you see all the things that you need to go right for your decision to work out. Imagining failure can also be helpful. It forces you to think about potential causes of failure and then find ways to solve for them. These were my most impactful takeaways, but Thinking in Bets: Making Smarter Decisions When You Don’t Have All the Facts is packed with good strategies for decision making under uncertainty, a critical but commonly overlooked skill. I highly recommend buying the book and reading the whole thing.